I used to have a BOSS, or Backup On-Set Solution. It was to lug my 15.4" MacBook Pro, external hard drives, and all the requisite AC adapters and chargers around, in addition to my camera equipment. After getting tired of that, my on-the-road backups became using the largest SD cards I could afford and hoping I could do the whole trip or shoot without swapping anything out until I got home. Obviously, this wasn’t a real solution, and is probably the worst thing you could do in the name of keeping data safe. LaCie has designed its co-branded DJI Copilot Hard Drive to help alleviate all these issues by ensuring it can perform backups direct from your memory cards, including external card readers, hold up to bumps and dirt, and operate entirely without a computer. 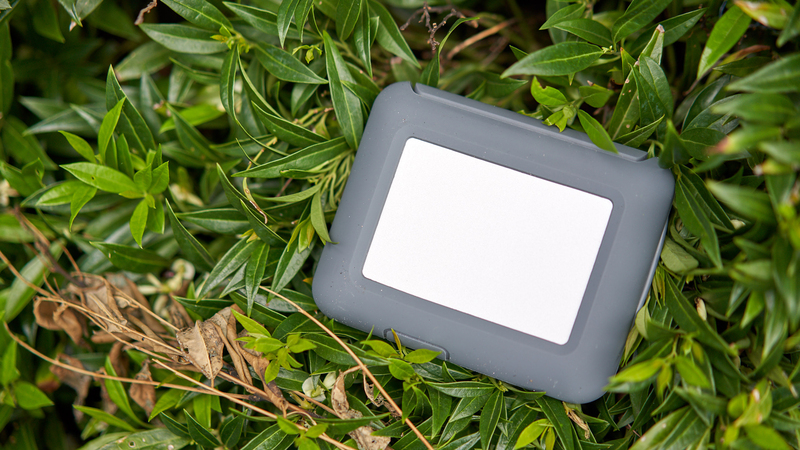 Targeting drone operators and other photographers and videographers who find themselves out on adventures for their work, the Copilot BOSS certainly seems up for the task when you pick it up. 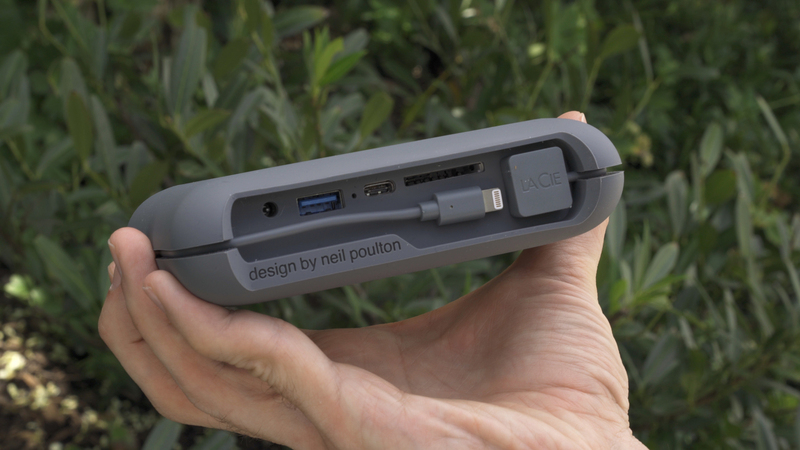 It has LaCie’s now ubiquitous rubber bumper, which clearly states “design by Neil Poulton,” though in an unobtrusive dark gray finish; it makes the Copilot appealing in any environment. The drive feels solid and it can hold up to a few drops without issue. Of this I am certain. Also, when the rubber cover is placed on the ports, the entire design inspires confidence that a bit of a fall won’t hurt, and a few drops of water and dust will be kept out, especially given its IP-54 rating. This drive even has a whopping 2TB capacity. Per LaCie’s data, this means you can load it up with up to 60 hours of 4K30 video, plenty for some of the heaviest shooting days. I’d personally estimate it to be closer to 45 hours at the 100 Mbps current models are shooting, but still a lot of room to work with here. There is a perfect variety of interfaces, as well, including a USB Type-C, USB 3.0 Type-A, and a full-size SD card slot. You should have no problem transferring footage and files from your phone, memory cards, or other drives. One feature that, in my opinion, separates LaCie’s offering from other portable backup drives, is the interface with your mobile device. Others tend to rely on finicky wireless, whereas the DJI Copilot uses a cable. It comes with Micro-USB, USB Type-C, and Lightning options so you can pick and choose which works with your smartphone and easily swap them out if needed. I like how it is set up on the drive because the cable can be wrapped around and securely set within the rubber bumper when not in use—much better than the tangle of cables normally sitting in my backpack. You don’t need anything to use the Copilot. Just plug in your media, tap the button a couple of times, and watch it transfer. Copilot even runs an MD5 checksum to verify your files are copying over without any issue. Making it better is the screen hidden in the metal case that lets you see what is happening quickly. 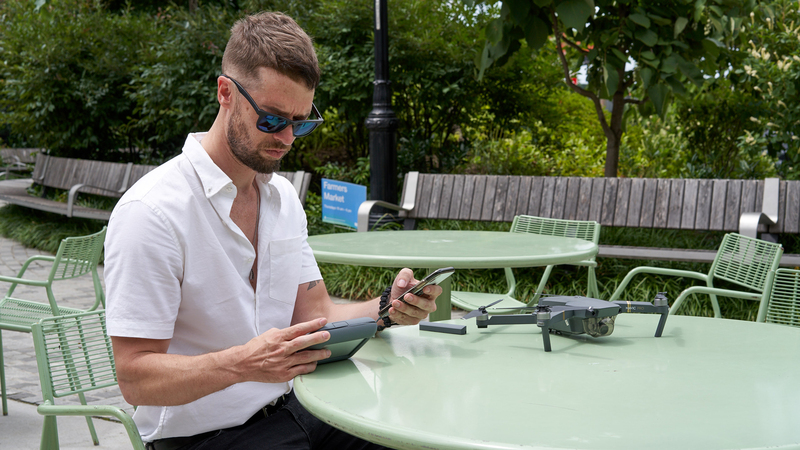 To get the most out of the hard drive, you should download the DJI Copilot BOSS mobile app. 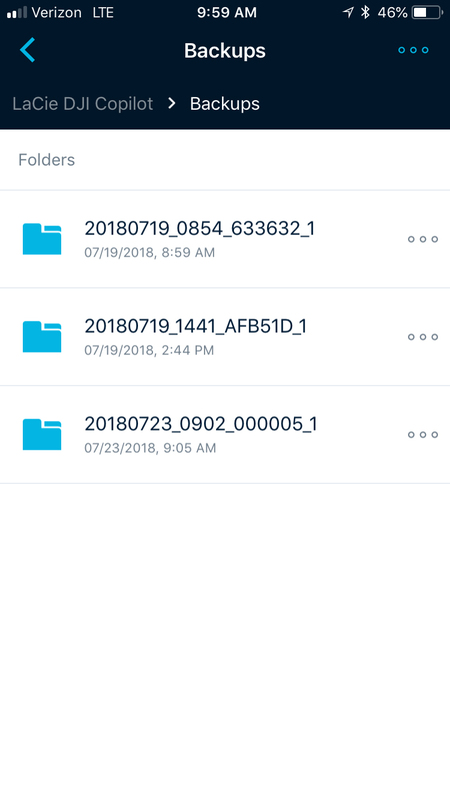 In the app, you will be able to see the different media connected clearly, decide what to transfer, create folders and move files around, and set up some preferences. 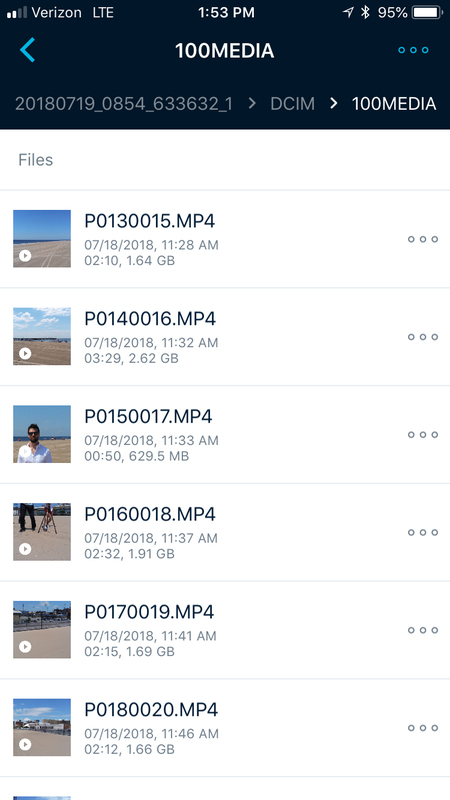 Reviewing footage and photos is the main draw of the app. 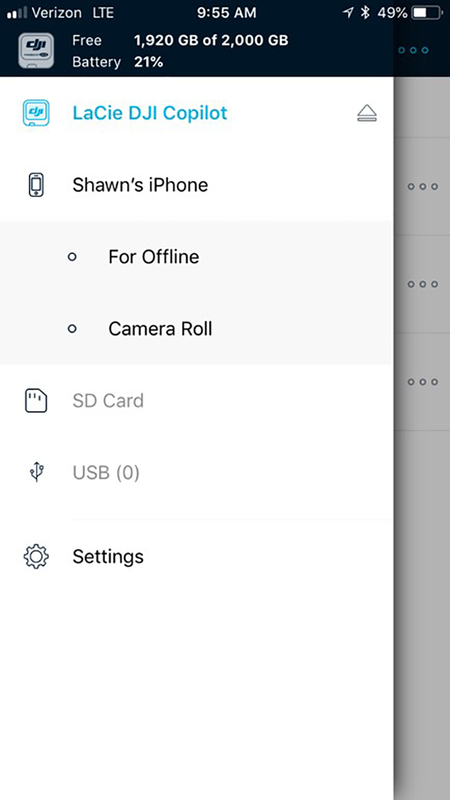 You can check everything on the drive and even save items to your phone or tablet with ease. View and manage RAW DNG uncompressed files through the Copilot BOSS app. Copilot also works with programs like Adobe Lightroom Mobile, allowing users to edit directly from the drive while in the field. The drive is fast enough to work with UHD 4K footage from my a7R III, giving real-time playback for clip a couple of minutes long. Another bonus of the app is that you can open the attached cards and storage devices without copying them over. It’s a little slower to read files, but it’s a nice thing if all you want is to pick out a couple of specific images or files to back up/transfer to your phone. There is an abundance of ports, but there is a surprising lack of charging options. As far as I could tell, it can only charge via the included AC adapter, which has a proprietary connection. Considering the number of devices I have that charge over micro-USB and USB Type-C and the fact that both of these connections are present on the Copilot, I’m a little upset that this requires its own charger that I now have to carry around. It does, fortunately, receive power from the computer when plugged in, so you won’t need to worry about charging up before you review footage on your laptop. Regarding the battery, it seems quite substantial, only using a few percentage points to back up a 16GB SD card, and it transferred at a rate of ~42MB/s while a USB drive hit speeds of ~90MB/s and a UHS-II SD card hit ~115MB/s. I will say that the SD card did drain 14% of the battery over six minutes of transfer time for 42GB, which seems a bit high if you need to back up a few cards sequentially. And then, speed testing on my computer over USB Type-C, I saw it up around 120 MB/s. All of this is respectable for a spinning drive, especially one suited for outdoors and portable uses. Copilot includes a DC wall adapter for charging and does receive a charge via USB but, as is standard with most devices, this is done at a slower rate. Being fortunate enough to have tried a few different types of portable backup tools, I would say that LaCie’s DJI Copilot is both the most well thought out and smooth to operate. If I had a few wishes for a future model, I would say an SSD model would be nice, as well as faster transfers and improved durability to bumps and drops—though at an expectedly higher price. Or LaCie could take the same setup as the Rugged RAID Pro and integrate it here for larger capacity or even more secure backups. Need a BOSS? The LaCie DJI Copilot is a well thought out hard drive that should deliver exactly what you want in a portable backup device. What are your thoughts on the latest mobile backup solution? Any questions about the Copilot? Make sure to let us know in the Comments section, below!